grandma's cookie jar: Celebrating with Buckets of Water! This past weekend we celebrated a milestone in my youngest grandson's life . . . he recently achieved being completely potty trained! A significant happening in the life of children - and a happy day for parents and grandparents for sure! Since I love celebrating, and this is a big moment in life, we have always held a "Hooray! I'm a Big Boy Now Party" for my grandsons when they became potty trained. This grandson was quite happy to have his special party - and wanted to celebrate by dumping a bucket of water on his dad's head! 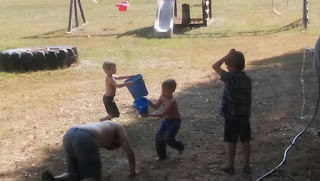 My son is a good sport - and a great dad and got down on all fours, so he was within reach for Shane to dump a bucket of water on his head - and of course his brothers had to get in on this opportunity as well! Happily it was in the 90's - very unusual for West Michigan in the end of September, so the boys dumped water on each other, themselves and ended up thoroughly soaked! It was a fun time - great memories! What do you celebrate with your family? We did the same thing for a granddaughter, but it was winter so we had cake and ice cream. A wonderful day indeed!